Microwave Honeysuckle Drying Process Line is a newly emerging food sterilization equipment in recent years.The use of microwave to sterilize food can effectively prolong the shelf life of food.Microwave has dual bactericidal effects of thermal and non thermal effects.Under the action of bacteria,the spatial structure of bacteria changes or destroys.Protein denaturation affects its solubility,viscosity,expansibility and stability,thereby losing biological activity,causing bacterial growth inhibition,stop or death.Microwave Honeysuckle Drying Process Line has the advantages of short time,fast speed,low temperature sterilization,drug composition,energy saving,microwave sterilizing equipment,sterilization,even and thorough,easy to automate production,advanced technology,and save floor area. 2. The time of sterilization is short. Microwave Honeysuckle Drying Process Line can quickly germicidal food, about 5 - 10 minutes to achieve bactericidal effect. Shandong Leader Machinery Co.,Ltd. is a hi-tech enterprise that is engaged in professional developing,producing and selling on microwave energy applying equipment Microwave Drying Processing Line,which is one of the biggest scale microwave energy equipment manufacturer Microwave Honeysuckle Drying Process Line in China since 2009.Shandong Leader Machinery Co.,Ltd. has microwave drying sterilization, microwave thawing, microwave vacuum drying, hot-air drying,combined microwave hot air drying five series of more than 50 products, Microwave Honeysuckle Drying Process Line has been widely used in food, condiment, agricultural and sideline products, medicine, flowers, wood, building materials, chemical raw materials, ceramics, rubber and other areas.Shandong Leader Machinery Co.,Ltd. has a group of professional sales team, established a perennial cooperative relations with some well-known domestic and foreign universities and enterprises,equipment exported to Europe, South America, Africa,Southeast Asia,the Middle East,Japan,South Korea,more than 30 countries and regions. 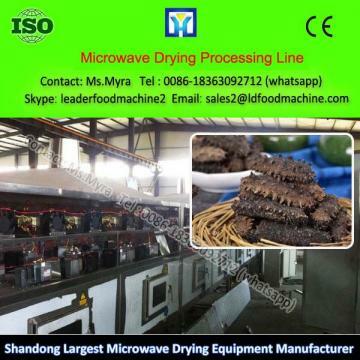 If you have any questions about Microwave Honeysuckle Drying Process Line don't hesitate to contact with us.